I liked to see a nice long sheet of green — a turnover meant that everyone’s crap was gone and I could haul out soaking wet towels and twisted-up sheets and vacuum and dust and start fresh. Makes were awkward; if the guests weren’t in the room, I had to tiptoe around their piles of toys and shoes and hilariously inappropriate lingerie while trying to make the bed and fluff the pillows. If the guests were in the room, I sometimes had to make small talk with them, the worst torture possible for my 18-year-old self. We were paid $9/hour, an amount that seemed enormous to me then (and still does — it remains the highest hourly wage I’ve ever been paid). Yet you’re not going to go very far with $9/hour if you’re not a student whose basic needs (housing, food, orthodonture) are already paid for, especially since hours fluctuated based on occupancy. Because the hotel was attached to the amusement park and the amusement park was seasonal, a lot of high schoolers and college students did work there. But there was also a mother-daughter team who cleaned rooms with the efficiency of German train conductors. There was an older woman whose daughter was incapacitated by a Lyme disease infection that had spread to her nervous system; this woman was always the first one offered extra shifts, though it made little difference in the face of her gargantuan medical bills. A lot of the other hotel employees were teachers, working during their summers off to supplement their salaries. Point being: we weren’t all just students working to pay for our beer and gas. A lot of people needed the money. After we cleaned a room and signed off on it being ready for habitation, we filled out a card with the name of the amusement park printed at the top in blue ink. HI, the card read, WELCOME TO DARIEN LAKE THEME PARK RESORT. MY NAME IS _______ AND I WILL BE YOUR HOUSEKEEPER. We filled out our names, marking the room as our own. I always tried to make my signature look as professional as possible. I thought that guests would want to tip me more if my signature conveyed that I was a person of strong character and moral rectitude. Or something. It had never occurred to me before I started working at the hotel that people didn’t tip their housekeepers. My family always tipped on vacation. It was just What You Did. God bless all of the people whose reaction to Marriott’s new tip envelope program was to gripe that now they’d be guilted into tipping — there were plenty of guests who stayed at the hotel during my time there who didn’t feel as persuaded by my poor little name card. We got our tips weekly from the housekeeping supervisor, who kept them locked in a metal box behind the front desk. Each housekeeper had an envelope with his or her name on it, and at the end of the week we gathered around the little box and waited for her to hand out of envelopes. It was every bit as awful as you might imagine. The lucky person, occasionally, would get a five-dollar bill. That was pay dirt. Once my envelope contained only 20 pennies. That one hurt. 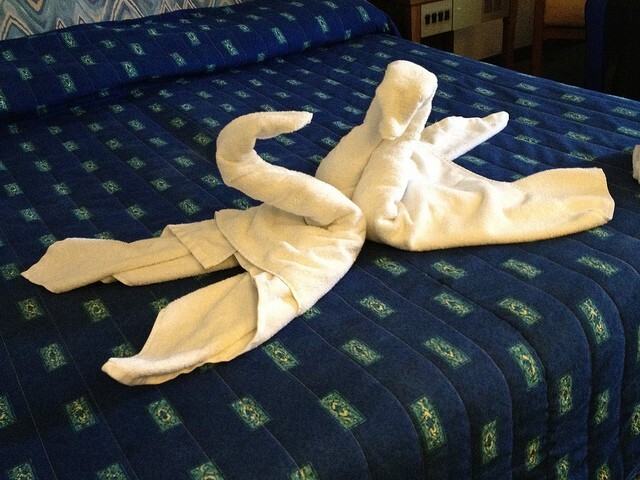 It hurt because housekeeping was hard work. It was physically hard: after eight hours of scrubbing toilets on my hands and knees and vacuuming with a vacuum that no longer had any suction and carrying piles of wet towels stained with God only knows what to the laundry chute and making beds and unmaking beds, it hurt to see only those 20 pennies. It felt like there should be more. And it’s not just that housekeeping is hard. It’s intimate. You have a key to a stranger’s room, where they sleep, where they shower and shave and brush their teeth. You pick their hair of the drain. A tip, in a way, is a nod to this intimacy: thank you taking for care of my private space. One morning, a man approached me at my cart. He was one of my makes and said he didn’t require service for the day, but wanted some clean towels. As I bent down and rifled through the bin for fresh towels and washcloths, he felt compelled to make conversation. He asked me if I lived in the area. I explained that I had gone to high school nearby but now went to Boston College. I was going to be a sophomore in the fall, I said. The man couldn’t have looked more surprised if I had said I was his own daughter. He laughed awkwardly, as though I had just made a joke. When it became clear that I wasn’t joking, he stood and stared at me. I stood and stared back, his towels clutched to my chest. I didn’t know if I was supposed to feel big or small. Big because this stranger now saw me as one smart cookie. Small because before he had seen me as nothing. A little speck. We’ve grown accustomed to believing that the minimum-wage workers that surround us every day should be invisible. We don’t want to think about the person who changes our sheets or scrubs our toilets or picks our hair out of the drain any more than we want to think about why we can get a McFlurry and fries at all hours of the night (because there is a human being making them and serving them to us). What I took away from my encounter with the man in the hallway was that I was the acceptable kind of service worker: working for low wages temporarily before moving on to better things. In the meantime, we’re left with the man standing dumbfounded in the hotel hallway. He had seen that his housekeeper was a person. And he couldn’t believe it. Caitlin Keefe Moran is an editor in New York City. She flails and procrastinates here.